Will rivals benefit from Chipotle E. coli scare? Chipotle's stock rebounded Monday morning, following a 12% plunge Friday due to new fears about an E. coli outbreak that may have originated in its restaurants. Shares were up 5%. But Chipotle (CMG) may have bigger problems than E. coli. Chipotle already appears to be suffering from the dreaded Wall Street disease known as Slowergrowthitis. The stock is down nearly 20% this year. And when Chipotle reported its third quarter results last month, investors were disappointed to see that the company's same-store sales growth was just 2.6% from a year ago. That was the smallest increase since a 1% rise in same-store sales during the first quarter of 2013. Last year, Chipotle's sames-store sales growth grew at an amazing 16.8% clip. Analysts are now expecting growth of just 3.6% for 2016. Meanwhile, some of Chipotle's rivals are putting up more impressive numbers lately. Taco Bell, owned by Yum! Brands (YUM), reported 4% same-store sales growth in the third quarter. And then there's Qdoba, the Mexican chain that is arguably most like Chipotle. Qdoba, owned by hamburger joint Jack in the Box (JACK), reported last week that its same-store sales were up 6.6% in its most recent quarter. This was the second consecutive quarter that Qdoba's same-store sales growth was higher than Chipotle's. Qdoba's sales were up 7.7% in its last quarter while Chipotle's rose 4.3%. Yes, the much larger Chipotle is still the king of guacamole. According to the informal Twitter poll I conducted Friday, an overwhelming majority of my followers still prefer Chipotle to Qdoba. Still, the E. coli problems could cause some consumers to try other chains -- even just temporarily. And that could be bad news for Chipotle -- which needs to gets its same-store sales rising at a faster clip again. 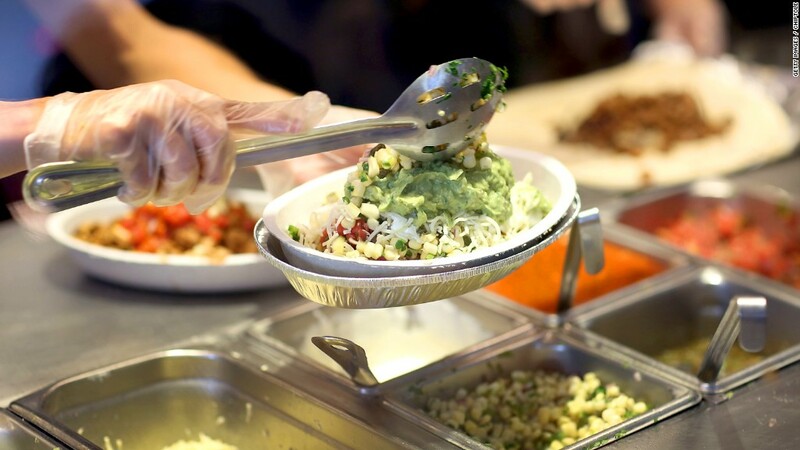 Wall Street analysts are suddenly as sour on Chipotle as the cream in the company's burrito bowls. BofA/Merrill Lynch downgraded Chipotle's stock on Monday to an "underperform" -- essentially a "sell" rating. CRT Capital downgraded Chipotle to a hold. And five analysts have cut their price targets on Chipotle in just the past week, according to FactSet Research. One of those analysts, Stephen Anderson of Maxim Group, said Monday that Chipotle "likely will incur cost -- at least in the near-term -- to provide additional scrutiny of the company's supply chain management." Anderson even upgraded Panera (PNRA) on Monday because he thinks "Chipotle's pain will be Panera's gain." It sort of makes sense -- even though Panera is not a Mexican food chain. Panera and Chipotle are often cited as being the two leaders of the fast-casual revolution -- fast food restaurants that serve better quality food than the likes of McDonald's (MCD), Yum-owned KFC and Wendy's (WEN). Anderson noted that Chipotle could lose market share to Qdoba and Mediterranean fast casual chain Zoe's Kitchen (ZOES) as well. He even thinks it's possible that same-store sales for Chipotle could fall in the fourth quarter. That may be a stretch for now. Chipotle's loyal fans are likely to stick with the company unless the CDC finds a lot more cases outside of Oregon and Washington -- where the original outbreak occurred late last month. But analysts are still predicting sluggish growth for the fourth quarter -- 2.6% again -- and only modest improvement to 3% in the first quarter of 2016. Despite this, Chipotle's stock still trades at 28 times 2016 earnings forecasts. That's pretty pricey. It's much higher than Jack in the Box and also a bit more expensive than Panera. And nothing makes investors more ill than having to pay a premium for a company that's not growing as rapidly as it once was.